This PDF 1.4 document has been generated by Canon DR-6080 TWAIN / Adobe Acrobat 8.26 Paper Capture Plug-in; modified using iText 2.1.7 by 1T3XT, and has been sent on pdf-archive.com on 29/08/2013 at 22:20, from IP address 174.79.x.x. The current document download page has been viewed 423 times. File size: 563 KB (14 pages). &quot;events&quot; in Guy, Arkansas, alone since September 10,2010. On Sunday, February 28, 2011, Arkansas had the largest earthquake in 35 years. cracks in their driveways and walls. Greenbrier and Guy, Arkansas, and ranged in magnitude from 1.7 to 4.7 in magnitude. County, and its surrounding counties as well, from what is called the Fayetteville Shale. and other chemicals to create fractures deep into the ground. it is contaminated with salt and other materials. Arkansas to accomplish this end. was entered on March 4, 2011. Capitol Avenue, Suite 1900, Little Rock, AR 72201. Avenue, Suite 1900, Little Rock, AR 72201. Chesapeake's assets and interests in the Fayetteville Shale for approximately $4.75 billion. now owned and operated by BHP. Keegan Drive, Suite A, Little Rock, AR 72202.
and caused damages in this State. 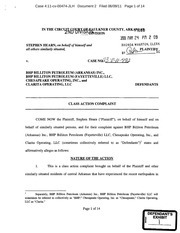 substantial part of the events or omissions giving rise to Plaintiff' claims occurred. the potential for installation of major gas gathering and transportation systems.&quot; [d.
Faulkner, Cleburne and White County. and began operations in early 2009.
began operations in early 2009.
have owned and operated the Chesapeake Well and the Claritia Well. were 31,882 households and 22,444 families residing in Faulkner County. that joinder of all members is impractable. the Class in a similar manner. 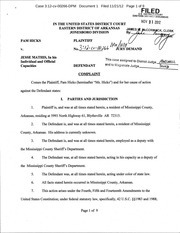 proximately caused by Defendants' operations. predominate over any issues affecting individual members of the putative class. common and uniform conduct of the Defendants in conducting their drilling operations. claims as a class action will promote judicial economy. importance of adequately representing the Class. consumer litigation and are qualified to adequately represent the Class. interference with the rights common to the general public. considerable diverse number of persons and entities. 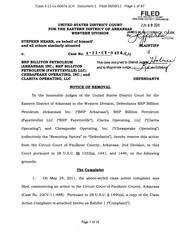 knowledge that there was a substantial risk of seismic problems in the State of Arkansas. 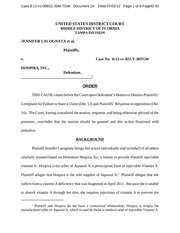 Plaintiff and the Class are also entitled to injunctive relief. The Defendants' conduct herein constitutes a private nuisance. have unlawfully and unreasonably interfered with those rights and privileges. cannot be eliminated by the exercise of the utmost care and is not a matter of common usage. between injection wells and seismic activity, and acted in disregard of these facts. d.	Economic loss from business interruption. 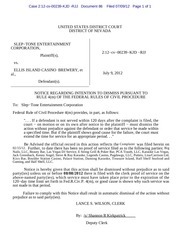 vibrations by Defendants constitutes a trespass. See Smith v. Lockheed Propulsion Co., 247 Cal. 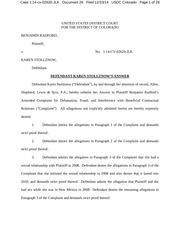 vibrations activated by defendant's conduct). Plaintiff respectfully demands a trial by jury. This file has been shared by a user of PDF Archive. Document ID: 00120871.